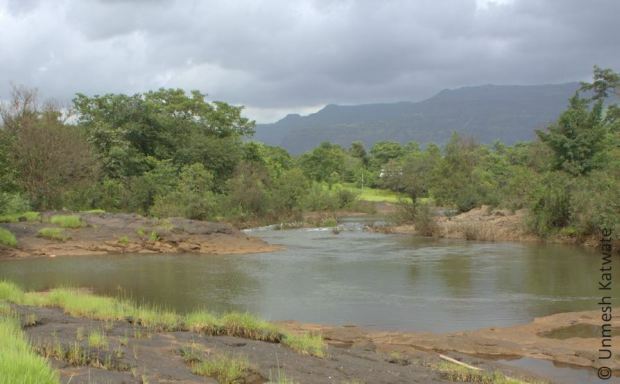 P. lutea is known from half-a-dozen rivers which drain westward from the northern portion of the Western Ghats mountains in Maharashtra State, India, and was collected only from clear, fast-flowing stretches. It can be told apart from all other members of the genus by the following combination of characters: presence of a distinct humped nape; lateral line complete; barbels absent; lips fleshy; snout with distinct lateral fold; 19–22 pored lateral line scales; eight predorsal scales; 9–10 prepelvic scales; 14–15 preanal scales; 4½–4 scales between dorsal fin origin and lateral line, and 2½–3 scale between lateral line and pelvic fin origin; last simple dorsal fin ray strong and serrated with 6–9 serrae on distal half of spine whereas 2–4 on apical half of spine; 13–15 branched pectoral fin rays; seven branched pelvic fin rays; caudal fin with 6–7+6–7 principal rays and 8–9+8–9 branched rays; 5 supraneurals; 6 predorsal neural spine; deep and enlarged infraorbital three; gill rakers three on epibranchial, one at angle and 14–15 on first ceratobranchial; one humeral band covering 3rd and 4th lateral line scale and extends to one scale up and down; one caudal blotch encircling caudal peduncle dorsally covering 17th–19th lateral line scale; dorsal fin without any bands and body dark yellow with iridescence on scale. Pethia consists of a group of species which were formerly included in the genus Puntius, all of which have a colour pattern comprising a black blotch on the caudal peduncle with other black blotches, spots or bars often present as well as a number of shared morphological characters. The description of P. lutea brings the total number of species in the genus to 36, of which 24 are native to India, and at least 8 to the Western Ghats region. Among these, P. lutea is told apart from P. narayani, P. nigripinna, and P. pookodensis by possessing (versus lacking) a complete lateral line plus differences in colour pattern. P. muvattupuzhaensis, P. punctata, P. setnai, and P. sharmai all have a complete lateral line, but P. lutea differs from all of them in exhibiting a large humeral spot on the 3rd and 4th lateral line scales which extends over one scale above and below the lateral line (vs. a small humeral spot on the 4th–5th scale below the lateral line in P. punctata and P. muvattupuzhaensis and a dorsolateral vertical band covering 3rd and 4th lateral line scales and scales above them in P. setnai)., and a posterior marking on the 17th-19th lateral line scales (vs. 19th-21st in P. punctata and P. muvattupuzhaensis and a vertical transverse band on 16th-18th lateral line scales and scales above and below them in P. setnai). These four species also differ variously in certain morphological aspects and in some cases, eye patterning. P. sharmai is a very different-looking fish and possesses 42 or more lateral line scales, among other differentiating factors. The authors also extend the distribution range of P. punctata by around 550 km since specimens were collected in Maharashtra during their field studies. 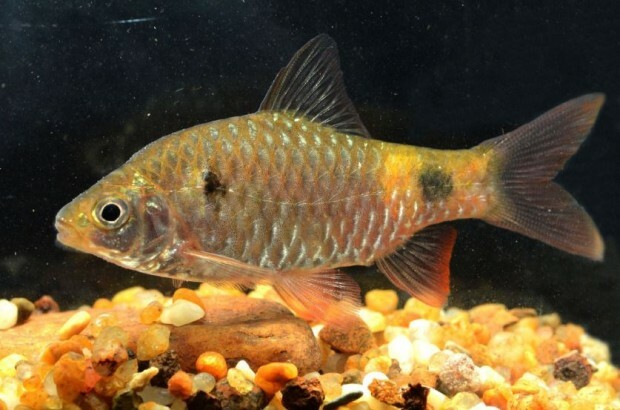 In addition, the long-held belief that the well-known P. ticto is a widely-distributed species is called into question, and this seems likely to have repercussions for the identity of many of the fish labelled with that name which enter the ornamental trade and have been referred to as such in aquarium literature. For further information see the full, open access paper: Katwate, U., C. Katwate, R. Raghavan, M. S. Paingankar, and N. Dahanukar. 2014. 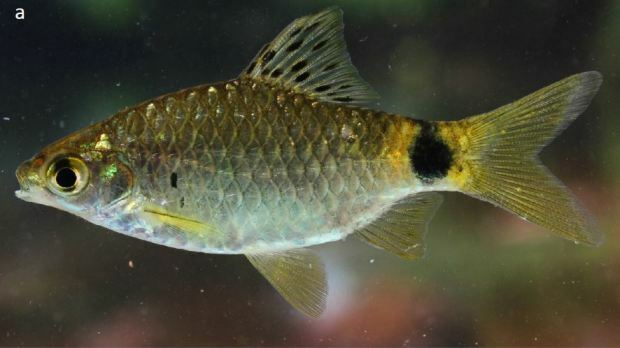 Pethia lutea, a new species of barb (Teleostei: Cyprinidae) and new records of P. punctata from northern Western Ghats of India. Journal of Threatened Taxa 6(6): 5797-5818.